Ontario, Canada, is a hotbed of loudspeaker design. Though dominated by several giant manufacturers, Ontario is also littered with a number of smaller, boutique companies that quietly churn out highly regarded, high-quality, consistently good-sounding speakers. Among them, Reference 3A, of Kitchener, Ontario, stands tall. Reference 3As latest speaker, the Episode ($5500 USD per pair), fits into the companys line right between the Grand Veena (recently reviewed by our own Albert Bellg), and the smaller Veena. At 45"H x 10"W x 16"D, the Episode is tall, with a profile thats hard to ignore, even in its light Natural Maple satin finish. In its darker piano-black lacquer (add $500/pair) or Cherry-Red finishes it would probably dominate a room, but the high-gloss lacquer and book-matched veneers of real wood impart the look of high-quality furniture. I prefer a more rounded, organic cabinet shape, but thats a matter of taste. The raked-back cabinet is simple in profile and, at 55 pounds, seemed sturdy and felt reasonably dead; Id wager that, inside, its very well braced. The sloping front baffle and first-order crossovers hint that the Episodes drivers are time-aligned; sure enough, Reference 3A claims that it is. All of the Episodes drivers are mounted in the upper third of the front baffle. At the top is a 12mm gold-anodized ceramic supertweeter from Murata. Ive experienced supertweeters before, most notably on the Tannoy TD10 I reviewed a number of years back, and feel that the returns from this technology are subtle but worthwhile. Below this one is a 1" soft-dome tweeter. Like those of all Reference 3A speakers, the Episodes 8" midrange/woofer runs wide open at the top of its range, relying on the drivers mechanical rolloff instead of a low-pass crossover. As in all such designs, the Episodes midrange/woofer will begin to limit its dispersion at the upper end of its frequency range, which will help define the speakers off-axis frequency response. The Episodes combination of a fairly large mid/woofer and a large cabinet points toward a fairly potent bass response, and Reference 3A does claim that the Episode extends down to 38Hz. The big payoff in removing the low-pass filter from the mid/woofer driver in such a design is that theres no crossover throughout the midrange, where nearly the entire range of such instruments as the grand piano fall. Reference 3A upholds its boutique status inside the Episode as well, cramming the cabinet with such high-rent parts as van den Hul wire, Mundorf capacitors, and Bybee Quantum Purifiers. Around back, the Episode is set up for biwiring with high-quality binding posts. Near the end of the review period, Reference 3A sent me a small care package containing a number of rubber washers with which to further isolate the woofer from the cabinet. While I noticed no change from this exercise, its nice to see that the company is constantly working to improve and refine their design. Reference 3A claims that the Episodes frequency response is 38Hz-100kHz, its efficiency a juicy 91dB, and its impedance a reasonably benign 8 ohms. The Episode should comfortably partner with low-powered tube amplifiers. Divergent Technologies, distributor of Reference 3A speakers in the US and Canada, is also responsible for sneaking Antique Sound Laboratory tube gear into the country from China, and when I asked Tash Goka, head of Divergent, to set me up with an amplifier that he felt would best complement the Episodes high efficiency, he sent along Antique Sound Labs AQ1005-DT single-ended triode 300b integrated amp. I alternated between the AQ1005-DT, used in bypass mode as a power amp only, and my own Audio Research VT100 tubed amplifier. The Episodes communicated with the power amps via Acoustic Zen Satori speaker cables. Analysis Plus Solo Crystal Oval balanced interconnects connected the amps to my Sonic Frontiers SFL-2 preamplifier, which in turn talked to my Aqvox Phono 2 CI phono stage. My Pro-Ject RPM 10 turntable hunkered down on my Target stand, lovingly holding in its arm my Roksan Shiraz cartridge. All power-supply duties were performed by Shunyata Research Taipan power cords plugged into a Shunyata Hydra Model-6 power conditioner. Frequency response this, off-axis that . . . were proud, here at Ultra Audio, to serve you up the technical details you need in order to make an informed decision, but we also realize you want to know how this here speaker sounds, right? The sound of the Reference 3A Episode was crisp, well defined, and immediately engaging -- and it excelled at dynamic shadings. Ive been following Calexicos mix of desert rock and Mariachi hijinks for a few years now, am enamored of their sparse, melody-filled sound, and found the Episode to be the perfect speaker through which to listen to The Black Light (LP, Quarterstick Records 52). Theres a fair bit going on in this album, and the band is a flying wedge with the guitarist as point man. The Episode was exceedingly quick through the midrange, in the manner of the best high-efficiency speakers. 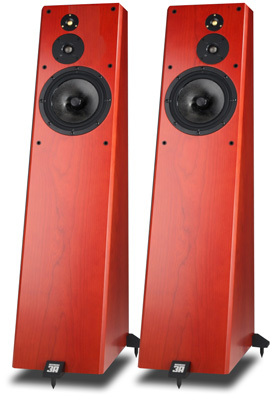 Over the years, Ive noticed that efficient speakers are more responsive than their less-efficient brethren, even when the latter are fed many, many watts; the difference is subtle but, once youve heard it, distinctive. Through the Episode, each pick of a guitar string was rendered with crisp delineation -- the attack, the leading edge of the transient rocketing across the room toward me. The Episodes floated a delicious image that extended behind the plane of the speakers, with the baseline of the soundstage residing just a hair toward the back. Heading farther south in the American music lexicon, I spun up Los Lobos La Pistola y el Corazón (LP, Slash 92 57901). This brief but delightful album of traditional Mexican music highlighted the core attributes of the Reference 3As. The light, bright, nimble music of tracks such as "Estoy Sentado Aquí" bring the musicians front and center into the room, and the Episodes put Los Lobos right here, with a feeling of immediacy to the vocals, a percussive snap to the guitars, and reasonably precise placement of the musicians. The lower midrange -- male voices in particular -- was beautifully present, images placed on and just slightly behind the plane of the speakers, with plenty of transient crispness. I hate to harp on this midrange business, but this was where the Episodes magic lay. Perhaps it had to do with Reference 3As penchant for running their midrange drivers without the intrusion of a crossover. Making a single driver responsible for delivering essentially the entire midrange brings that elusive goal of midrange coherence that much closer. Whatever the reason, the Episode was one mighty engaging speaker. Slightly higher in frequency, the Episodes soft-dome tweeter was astoundingly free of grain. This tweeter has an easy life: Because the midrange hands off to the tweeter at a fairly high frequency, the smaller driver doesnt have to go very low, and so can loaf along doing what it does best without worrying about occasional forays into the upper midrange. Cat Powers Jukebox (CD, Matador OLE 793-1) is a huge studio recording whose sound bears little resemblance to that of an actual concert hall. That said, its delicious sound can take over the entire room. The cymbals on "New York, New York," while obviously not recorded in the same room as Chan Marshalls voice, are front and center in the mix, and the Episodes reproduced them faithfully, adding perhaps just a tiny bit of shimmer, a little sparkle. The Episodes tweeter is far from hot in the traditional metal-dome sense; rather, its smooth, extended, and relaxed, with a sinuous, almost tube-like sweetness. If forced to choose between an extended but overly crisp top end and one thats rolled off but smooth, Ill always choose the latter. For me, an abrasive top end makes a speaker a chore to listen to. With the Episode, I got the best of both worlds: a treble that went on forever, and no hint of harshness. But . . . Caution! Reviewer-assumption alert! I say that the Episodes tweeter is extremely extended, but theres that supertweeter sitting proud at the top of the cabinet, and I got the feeling that it, too, had something to do with the air I heard in the top end of cymbals and the overtones of guitars. There was also some monkey business going on down in true tweeter territory. The harmonics of Chan Marshalls voice sounded suspiciously rich and fleshed-out, and while this was a wonderful effect, Im not used to hearing it, and wonder if it was an artifact, however welcome, of the Murata supertweeter. Either way, Im dissecting here what was a fantastic top end; no matter its origins, I liked it. My only caveat about the Episodes treble was in wondering how it might mate with a dead-neutral solid-state system. The system chez Thorpe is all-tube and quite plush-sounding, and with a back end thats less well padded, I might be concerned that the Episodes were a touch hot up top. The only way to find out is to give a listen, right? Given the high quality of the Episodes treble, I wouldnt let this concern be a deal-breaker without first having heard this speaker. Ive left the bass for last. It took me a long time to get a handle on the Episodes bottom end, and for a while I was conflicted in my opinions. At first I felt that the speaker was somewhat bass-shy, as I didnt notice it doing much down low. The music was there, all right, but the bass didnt impress me that much. As time went by, either the Episodes bass changed (Tash Goka told me that the review samples had been well broken in) or my perception of it changed. It was the latter, Ill wager; Ive experienced such shifts before, arriving unlooked-for and quick as lightning. One day, I was sitting there listening to Beth Ortons Central Reservation (LP, Arista/Classic 2011), and, as if a switch had been flipped, I suddenly realized that there was a fair amount of tight, deep bass filling my listening room. Why this shift in perception? Well, its an audiophile truism that bass thats immediately impressive is precisely the kind that you dont want. Pumped-up, overbearing bass is a sure path to musical dissatisfaction, and Im usually on guard for this kind of freshman trick. Still, the Episodes bass was very quick, very tight, and, while not on the lean side, was far from the rich end of the spectrum. There was an agility to the Episodes bottom end that perfectly complemented the rest of the frequency range, and its more than fair to say that its nether regions didnt remotely call attention to themselves. But do remember that quick, tight, and agile are not euphemisms for bass-shy. I found the Episodes bass innately satisfying, and refreshing in its honesty. I doubt that the Episode will impress those who demand slamming, chest-pounding bass, but that sort of performance is far easier to achieve than are the quickness and agility that this speaker could display, and that are the hallmarks of accurate bass. The Reference 3A Episode rendered music in a most alluring manner. This is one musically satisfying speaker that doesnt resort to overt tricks to achieve its goal. If youre looking for a speaker that will draw you in closer to your music and make you want to keep listening to it over the long term, be sure to add the Reference 3A Episode to your audition list. Price: $5500 USD per pair.